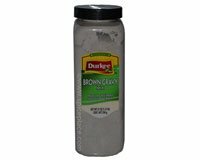 Durkee Brown Gravy mix has been discontinued by the manufacturer. The suggested replacement product is McCormick Brown Gravy Mix instead. Regular homemade gravy is usually a combination of fat drippings, and flour. Durkee Brown Gravy offers a low fat substitute, with homemade gravy taste. Use anywhere you would use homemade gravy such as over meat, mashed potatoes, rice, etc. Tones Brown Gravy, low in fat, high in taste! Delicious in taste, simple to make, and non-fat. What could be better? Ingredients: Wheat Flour, Modified Food Starch, Salt, Dextrose, Whey, Onion Powder, Beef (Broth, Fat and Extract), Caramel Color, Hydrolyzed Corn, Soy and Wheat Protein, Corn Syrup Solids, Autolyzed Yeast Extract, Sodium Caseinate (Milk Derivative), Disodium Inosinate, Disodium Guanylate, Lactic Acid, Disodium Phosphate, Thiamine Hydrochloride. Allergy Information: Contains Wheat, Soy and Milk.